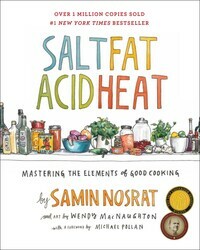 In her best-selling cookbook SALT FAT ACID HEAT, celebrated food writer and chef Samin Nosrat dishes up the four universal elements of good cooking: salt, fat, acid, and heat. And at Tips on Life & Love, she’s shared her tips and tricks to salting and the perfect liquid-to-grain ratio. Now, Netflix is gearing up to bring Samin’s expertise to television too! 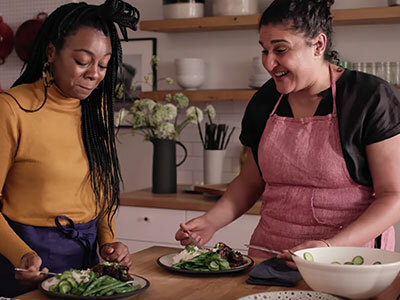 If you’re a foodie, you won’t want to miss the 4-part documentary series Salt, Fat, Acid, Heat (inspired by the cookbook) that follows Samin as she travels to kitchens in the U.S., Italy, Mexico, and Japan in pursuit of flavor and making cooking accessible to everyone. Stream Salt, Fat, Acid, Heat on Netflix beginning October 11 and click here to learn more about the cookbook that inspired the show! New York Times Bestseller A visionary new master class in cooking that distills decades of professional experience into just four simple elements, from the woman declared “America’s next great cooking teacher” by Alice Waters.In the tradition of The Joy of Cooking and How to Cook Everything comes Salt, Fat, Acid, Heat, an ambitious new approach to cooking by a major new culinary voice. Chef and writer Samin Nosrat has taught everyone from professional chefs to middle school kids to author Michael Pollan to cook using her revolutionary, yet simple, philosophy. Master the use of just four elements—Salt, which enhances flavor; Fat, which delivers flavor and generates texture; Acid, which balances flavor; and Heat, which ultimately determines the texture of food—and anything you cook will be delicious. By explaining the hows and whys of good cooking, Salt, Fat, Acid, Heat will teach and inspire a new generation of cooks how to confidently make better decisions in the kitchen and cook delicious meals with any ingredients, anywhere, at any time. Echoing Samin’s own journey from culinary novice to award-winning chef, Salt, Fat Acid, Heat immediately bridges the gap between home and professional kitchens. With charming narrative, illustrated walkthroughs, and a lighthearted approach to kitchen science, Samin demystifies the four elements of good cooking for everyone. Refer to the canon of 100 essential recipes—and dozens of variations—to put the lessons into practice and make bright, balanced vinaigrettes, perfectly caramelized roast vegetables, tender braised meats, and light, flaky pastry doughs. Featuring 150 illustrations and infographics that reveal an atlas to the world of flavor by renowned illustrator Wendy MacNaughton, Salt, Fat, Acid, Heat will be your compass in the kitchen. Destined to be a classic, it just might be the last cookbook you’ll ever need. With a foreword by Michael Pollan. Share Watch the Trailer for Netflix’s Salt, Fat, Acid, Heat Series!